Central retinal artery occlusions occur when a retinal blood vessel becomes blocked or plugged by a blood clot or similar “embolus.” CRAO causes sudden painless loss of vision is a type of retinal vascular occlusion (RVO). 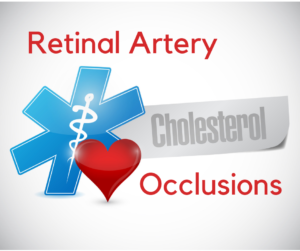 Similar to a branch retinal artery occlusion, the CRAO may be a sign of more serious cardiovascular disease which may lead to heart attack or stroke. As the name implies, the entire retina is involved. A central retinal artery usually causes profound vision loss as the macula is almost always involved. In a lucky few patients, the macula is spared because of the presence of an accessory artery which maintains macular blood flow. Some patients have a “cilio-retinal artery” which can spare central vision. This is an accessory artery which is independent of the central retinal artery. As with other retinal vascular occlusions, painless sudden vision loss is the hallmark. An embolus is a small particle of cholesterol (Hollenhorst plaque), clump of platelets, glob of fat or calcified material that usually originates from the carotid arteries or from the heart (e.g. abnormal heart valves or abnormal beating of the heart). The embolus breaks off and travels up into the eye and occludes the entire retinal artery. Blood flow immediately ceases causing the vision loss. Emboli from fat are much less common. In general, there is nothing to do for a CRAO. While immediate treatment can involve attempts at dislodging the vascular plug, these attempts generally are not successful. Ideally, dislodging the clot should occur less than 24 hours after the CRAO occurs. Most patients come to the office well after the 24 hour mark. Though little can be done to improve the vision loss, follow up is important to prevent complications from loss of blood supply. As with all forms of vascular occlusions, complications from neovascular glaucoma can develop and lead to a very painful condition. In patients with artery occlusion (BRAO and CRAO), coordination with the patient’s PCP or cardiologist is important as there is a high correlation between artery occlusions and systemic cardiovascular disease.